The struggle for visibility (documents) has always played a central role for Tibetans living in exile, especially for those living in India and Nepal. In this post, I look into this struggle that Tibetans in India face as newly arrived Tibetans from Tibet (second half) and Tibetans born and raised there (first half). During my stays in Dharamsala, India, I came across several different socio-cultural-political-economic phenomenons that have been emerging as a result of the lack of visibility for Tibetans living as, what I refer to as non-refugee refugees, in bureaucratic India. In the following, I take a closer look at one of these emerging intercultural phenomenon currently shaping the possibility of existing on paper for Tibetans especially from Tibet that bureaucratic India has yet to offer. The other day, while I was roaming through updates on my Facebook newsfeed, I came across a Facebook status discussion that a few of my Tibetan friends were taking part in. The topic centered on the difficulties of living in exile, specifically India, as “refugees”. Tenzin’s status (name changed) shared that he had recently walked away from a possible job offer in the banking sector in Delhi. According to him, he had “cleared all the [different] levels of interview as well as the aptitude tests” and was asked “at the end [of the interview]” to show them his identification proof in order for them to officially accept Tenzin as an employee. On showing his Residential Certificate (RC), he explains, they became confused and asked for another form of identification that looked more official. He explained his status as an “exile Tibetan”, that the Indian government issued the Tibetan exiles an RC. The company personnel’s discussed the issue among themselves and told him they could not offer him the job without another official identification document that they could identify and approve. He explains he “remained helpless” and proceeded to tell them that “this [was] everything [he] had,” and finally asked them for his RC back and left. I highlight this story because this brings up an important contemporary issue for Tibetans living as refugees in India: the conflict of not having proper documents that get in the way of Tibetans living as refugees in India from doing the simplest of activities—such as; getting a job, entering school, or traveling—that average citizens with documents may take for granted. After the invasion and occupation of Tibet by China in 1959, many Tibetans fled to India. The first wave of Tibetans that escaped from 1959 to the 1970s were recognized as refugees and granted asylum by the Indian government. The Indian authorities issued each Tibetan an RC—a legal document that allows Tibetans to legally live and travel within the country, serves as an identity document, and is a pre-requisite for the Identity Certificate (IC), a necessary document for international travel. However, in an attempt to build Sino-Indian diplomatic relations, the Indian government stopped legally recognizing Tibetans as refugees in 1963 and made it difficult for Tibetans that arrived after the initial wave to acquire RCs and ICs. Nonetheless, this did not stop the flow of Tibetans escaping from Tibet to India. For Tibetan refugees that are not recognized as “real” refugees, the issue of documentation, or rather the lack of documentation, is a real one that interrupts even the most mundane of activities. Recently, on March 25th, 2013, the Indian Nursing Council sent a letter to all universities and State Nursing Councils stating that “all Tibetans, being foreigners, cannot work as nurses in the country” (Phayul. Sep. 6th, 2013). Nursing in the two decades has become the preferred study and professional avenue that many Tibetans in India have utilized to become financially independent for themselves and their families. In fact, my younger cousins in India just finished a 5-year intensive diploma in Nursing and now remain defenseless to this new policy (new development on this case by Sikyong Lobsang Sangay; however, “the Indian Nursing Council has said it would not change its decision.”). Like Tenzin, having an RC still leaves Tibetans vulnerable to discriminatory policies that make life difficult for Tibetans born and raised in India. In addition, for the Tibetans that continue to make the journey from Tibet to India—who do not legally qualify for the RC or the IC—life becomes even more difficult due to their lack of documentation and keep them contained within the small Tibetan exile communities in India, where they are offered some support from the Tibetan government in exile and NGOs. However, organizational help is restricted within the Tibetan communities and not outside in greater India where they are exposed to possible arrest if caught without documentation. Despite these difficulties, Tibetans have found other legal and illegal ways to meet the challenges of being identified as either non-refugee refugees or having no identification at all in India. Out of all the options that Tibetans have made available for themselves in India, the most popular has been legal and illegal immigration to the west. Opportunities for small groups of Tibetans to migrate to different countries in the west where different rules applied began in the early 1990s. Immigration to the west provided Tibetans the option of citizenship; this allowed Tibetans many choices not limited to owning property, business, and the ability to travel with ease—something that was not easily available without illegal means (bribing local authorities to own property or to operate privately businesses, buying fake Indian documents for everything and anything, etc.) in India. More importantly, citizenship offered Tibetans a legal way to return and reunite with family many had not seen since their initial escape from Tibet, while others that were born outside of Tibet, this provided a safer legal way to see Tibet for the first time. Due to the possibilities of citizenship, something that was not available to Tibetans in India until very recently, many Tibetans have opted to migrate to the west. This was made possible when one member of the family had already migrated, and several years later, they worked out all the legal details to bring other members of the family abroad. This has proved so successful that places such as New York, USA and Toronto, Canada have become homes for over 8000 Tibetans and growing with thriving communities. The interest in moving to the west has generated multiple social and cultural phenomenons – both legal and illegal – within the exile Tibetan communities in India over the last few decades. While India-born Tibetans face challenges with the RC, recently arrived Tibetans from Tibet—called sarjorpa, newcomer, by Tibetans born and raised in exile—don’t have family in India, let alone abroad, this makes the possibility of their immigration to the west more complicated. With no legal documents, nor the funds to illegally obtain forged RCs and ICs, the newcomers are the most vulnerable to life in India. Bureaucratically, they are considered illegal and do not exist on the grid; because of this they are the most susceptible to arrest and can serve time depending on whether they have the funds to provide for legal representation. Because of these vulnerabilities, most seek out different options to immigrate to the west. One of these cultural phenomenons happens to be: marital unions with westerners. Last winter I returned and began living in the Tibetan community in Dharamsala, India. During my stay, I took notice of something that has been taking place for a decade: the phenomenon of western (almost exclusively white) women in Dharamsala who were either with or seeking Tibetan men. The reason for why the racial make up of these women happen to mostly be white is because most of the tourist in Dharamsala, India, happened to be or look Caucasian. These women that came to Dharamsala were of various backgrounds; seeking different experiences as students, travelers, artists, or humanitarians on their short/long stays in India. Some had fallen in love during their stays in Dharamsala while others came specifically to seek Tibetan men. The men on the other hand were almost entirely newcomers—recently arrived or settled Tibetans from Tibet. This is not to say that all newcomers were attracted to white women, since there were newcomers that were not particularly interested in white women. Also, I did notice few newcomer women with white men; but the majority of the western-Tibetan heterosexual relationships I noticed in the town were between white women and their newcomer partners. This was partially due (among many other reasons) to newcomers often sharing the tourist space either as employees at cafés and restaurants (considered labor intensive work that most exile Tibetan men avoid) or as friends of the employees of restaurants and cafés they frequented. It seemed that most India-born and bred Tibetan men worked either in privately owned family businesses or the Tibetan (non)government-related institutions where they had less contact socializing with westerns of different backgrounds. India-born Tibetan women on the other hand hardly mingled romantically alone with white men in public. Like the India born men, the women also worked and shared the spaces in the private sectors and (non)governmental institutions. However, there were also gendered reasons for why Tibetan women didn’t seek out western or newcomer partners. From what I was advised and noticed, Tibetan women did not frequently socialize alone with Tibetan men, unless the opposite sexes were hanging out in groups. This had much to do with Dharamsala being a small space where women and men often complained about gossip. It was also a space where women were disciplined by family, society and themselves to keep their honor and status intact. Although there were a few exile Tibetan women who did occasionally date western and newcomer men, most had exile Tibetan men as partners—most of whom they had known since childhood and/or shared similar backgrounds in schools and other social spaces. On a much smaller scale, some Tibetan men that were not necessarily born in India but were raised there, occasionally sought out western partners. They were young men who had been brought to Dharamsala by parents from Tibet to be admitted at a young age (between 6-10) to the Tibetan Children’s Village (TCV) schools, the Dalai Lama’s school, and had grown up and graduated within the boarding school system with none or minimal (occasional phone calls) contact with their parents back in Tibet. Although they fared better than the newcomers because they had RCs and ICs, they too, like the newcomers, lacked access to a network of family and security that could help improve their lives in India. This past year wasn’t the first time I had noticed these relationships, but it was the first time I shared close friendships with some of these women and their Tibetan husbands, soon to be husbands, or lovers. This new perspective allowed me to see these relationships outside the category I had previously placed them in: superficial and fake. Whenever I hung out with my white friends who had Tibetan partners, aside from conversations about the usual ups and downs that one expects from the standard romantic relationships, documentation – or lack there of – was a central discussion. Almost all of the men and women in these relationships were not oblivious about the possibility of the unionship offering the men a chance at existing bureaucratically on paper and the prospect of citizenship in another country, whether the men were seeking it or landed into it. Both parties were aware that citizenship offered these men the chance to go back to Tibet safely—some who had not been back since childhood—to see family again. The men were less vocal about it due to the negative connotation the community has about Tibetans, especially newcomers, who are thought to marry white women just for papers and how that negatively affects the overall peaceful-humble Tibetan image. This is not to deny that some relationships by some Tibetan men were initiated purely to help gain access to immigration and the prospect of a better life, however, at the same time, there were also white (and sometimes older) women who came to Dharamsala only to seek younger Tibetan husbands. But such relationships were the exceptions – most of the couples I interacted with shared an emotional bond with the knowledge of possible migration that both sides hoped for and encouraged. Although the dating sections of the different Tibetans living in Dharamsala are brief generalizations that could each use a research on its own, my intention was to create a general overview of the dating landscape in the town. They are by no means limited to the short summaries I have given them above. The reason for why I raise these (un)usual unionships is to shed light on how the bureaucratic issues that Tibetans in India face end up creating these (inter)cultural ones. Knowing some of the challenges Tibetans in India face as non-refugee refugees, it made it harder for me to pass judgment on these relationships however authentic or not they felt. Though I will not get into the details of them here, there existed complex issues of power between those who needed bureaucratic visibility (Tibetans) and those who offered those possibilities (white women) (this topic alone needs a whole different research on its own). I often struggled with giving my white female friends honest relationship advice when they seemed to have real relationship issues, but I always held back because it felt like too much was at stake. These relationships weren’t simply romantic relationships. They offered some Tibetans the opportunity to exist-on-the-grid on the one hand but were laced with unequal power dynamics on the other. The lives of Tibetans in India with their precarious non-refugee refugee status and their struggles for achieving visibility attest to how, as the call for papers for this conference I participated in noted: “despite—or perhaps because of—the seeming indifference and alienating power of peoples’ experiences with bureaucracy, bureaucracy [or lack there of] can reach into the most intimate of spaces of life.” For many Tibetans, to secure a life and a future, it is dependent not only on love and partnership but on the papers that accompany these unions. Such examples help widen the conversations currently taking place on the complexities involved in citizenship and bureaucracy. Thanks for this post. As a white woman in a marriage with a Tibetan husband living in Dharamsala, I identify closely with the complicated dynamics you’ve described here. Please keep working on this important topic! After 2 years of living in Dharamsala, my understanding is that Tibetans are required to have and present an RC issued by the local Indian government in the settlement in which they live. I’m confused that you write that some cannot acquire one. As for the desire of Tibetans to marry white foreigners, I can speak from much personal experience and what I witnessed from my friends…I have never seen a single case (ok perhaps one) of such relationships working out once they left India, and do not know of any that were based on anything other than the Tibetans delusion that life is magically better in western nations. Its not compulsory to change the Indian Citizenship to get valid identity card. You can apply for PAN Card, Driving license, Adhar Cards etc. Through legally with support of bonafide letter from your related institution or association where you studying or working. 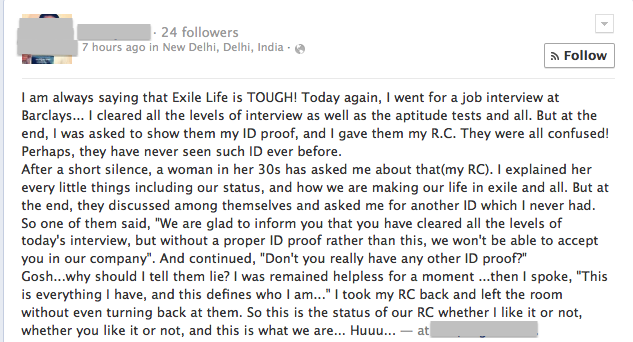 There are alternatives to using the RC as identification in India. On the first part of your post about ID papers. I know the TGIE/CTA in Dharamsala have always discouraged Tibetans in India from taking out Indian citizenship – but at the same time, since the 1970s, they have encouraged Tibetans who emigrated to Switzerland, Canada, etc. to become citizens of those countries. Applying different rules to Tibetans born and living in India seems hypocritical. Lhakar Diaries is a blog dedicated to Lhakar, or, "White Wednesday," a non-cooperation movement in Tibet based on non-violent strategy, where ordinary men and women actively resist China's occupation by supporting Tibetan businesses, eat Tibetan food, wear Tibetan clothing, speak Tibetan language and celebrate the Tibetan identity. We are a team of young Tibetans around the globe, highlighting these examples of civil resistance inside Tibet. Lhakar Diaries serves as a platform to promote similar actions on the outside, showing our solidarity with Tibetans in Tibet. Each Wednesday we share our personal journeys with our essays, artwork, music and exploration of our shared cultural heritage and identity. Registration Open For Tibetans of Mixed Heritage Conference, October 9-13, Join Us in Dharamsala! All written content on this blog is copyrighted. Republication requires written consent. Write to LhakarDiaries@gmail.com.